Film Photography Lust: Canon EOS Elan II - A Freebie! 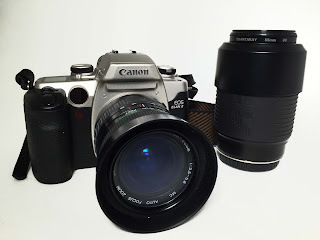 One of my next cameras up will be this SLR beauty, a Canon EOS Elan II. One of my section heads at my day job know that I like to use film cameras, so he gave it to me. I told me today that he was cleaning up his house and came upon this film camera that he hadn't used for over 10 years. He had absolutely no desire to keep it, so I was happy to give it a new home. There was a 1/2 developed roll in the camera, so I swapped out the battery (he had a spare one in the camera bag) and force rerolled the film. He had no clue what was on it...fun. I gave it a very quick dry run and it looks good to go. I will want to get a 35 or 50mm f/1.8 lens for it, or maybe a 40mm pancake lens. That's more my style and then take it out this weekend.